Good Luck! Get images that. make Supersized seem small. 2018 PANINI XR DOUG BALDWIN RED PARALLEL, #93 AND SERIAL #'D 154/299, LOOK!!. CARD IS #93 AND SERIAL #'D 154/299. ANY GLARE OR SCRATCHES ARE FROM SCAN NOT A CARD ISSUE! DON'T MISS OUT ON THESE REAL SHARP LOOKING CARDS! THESE ARE TOUGH HITS ! DON'T MISS OUT ON THIS LIMITED RELEASE! 10 or More Cards - 25% Reduction. 5-9 Cards - 10% Reduction. UP FOR SALE IS A... 2016 Rookies & Stars #72 Doug Baldwin Gold Parallel 2/10 of the Seattle Seahawks I included a closeup of the serial numbering. It's a little hard to see from the placement on the card. Please see scan for exact condition. Card has been stored in a penny sleeve and toploader and kept away from the light. Only taken out of protection to be pictured so you can see any imperfections when buying. Card will be shipped in a toploader and team bag packaged securely inside of a bubble mailer shipped via USPS. 2018 Unparalleled High Flyers Autograph Doug Baldwin (7/10). 2017 PANINI DONRUSS OPTIC FOOTBALL - STARS, RATED ROOKIES, RC'S - U PICK!! 2017 Rookies and Stars gold insert card of Doug Baldwin. The card is #20 in the set and is VERY nice. The card is serial numbered #01/10. 2017 PANINI PHOENIX ( ROOKIE, RC's, STARS, HOF) - WHO DO YOU NEED!!! 2018 Panini Prizm SEATTLE SEAHAWKS Team Set. Contains all base cards for this team (1-200). Checklist provided below. Cards average Nr/Mint condition. 021 Doug Baldwin. 022 Kam Chancellor. 2017 Donruss SEATTLE SEAHAWKS Football Team Set. These contain all base and rookie cards for the team listed (1-400). Cards average NrMint condition - Included players listed below (07)-216 Doug Baldwin. 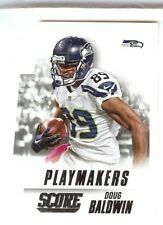 2015 Score Football Doug Baldwin Desert Camo SP Playmakers insert card as pictured.